We at Highline Car Care service import vehicles as well as domestic vehicles. The services we offer are just as varied as our experience. Come see us today for the most efficient oil change Gilbert has to offer. It’s important to get this done regularly, so we make it easy on you. We’ll let you know exactly when your vehicle will be ready. Our experience with all different makes and models has helped us craft a complete checklist of things to monitor. We won’t miss any warning signs. Come to Highline Car Care for your next tune up in Gilbert. We live and work in Gilbert, so we understand the need for A/C in the Arizona heat as well as anyone. We can fix your A/C unit right away to get you comfortably on the road again. If you’re tired of a bumpy driving experience, don’t hesitate to get your shock and struts replaced. We’ll restore your car to the smooth ride it was when you first got it. Driving with bad brakes isn’t an option. Restore your peace of mind and keep yourself safe by getting your brakes serviced as soon as they start to become an issue. Repairing or replacing a navigation unit can be costly and take a long time. Luckily we have the experience to minimize your cost as much as possible. We can resolve a whole range of problems with your navigation system. If your car isn’t starting as quickly as it used to, that may be a sign of bad things to come. It’s important to get your battery serviced before your car refuses to start when you need it. The best time to care for your vehicle is before it develops serious problems. For the best preventative maintenance in Phoenix, come see us at our auto shop in Gilbert. Our trained professionals will give your car a checkup and see what we need to do to keep it on the road longer. 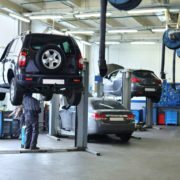 Getting automotive service can be a nightmare for busy professionals. If you don’t have time to leave your job, use our valet maintenance service to remove the stress from car care. If your business depends on vehicles, it’s especially important that they run perfectly. That’s why we service fleet vehicles too! Come see us today to see why our customers come back again and again for all the services they need. Call us at (480) 336-2889 to set up your appointment!